Experience, however, relaxing and adventurous vacation in the Binn Valley, a beautiful hiking & Minerals paradise. We offer a homely 4 5 room apartment on the first Stock at an older wooden house. The house is located (above the hotel Ofenhorn) in quiet, sunny location in the village of Binn. Types of rooms: 2 double bedrooms and 1 single room, bathroom with shower, spacious kitchen, living room and large south facing balconies. There are in the house a wireless connection, which may be used. The apartment is rented during the winter. For baggage loading and unloading may be driven by car to the house. You can find a paid parking lot about 5 minutes and a free car park about 10 minutes walk from the house. A public children's playground is literally right by the cottage. Kitchen towels are included in the rent. Garbage bags are not included and available separately in the village shop in the village of Binn. Newly renovated bathroom with large shower, wash basin and WC. Zeer royaal appartement. Goed ingedeeld.Gastvrij ontvangst met een gedekte tafel. Wij voelden ons meteen thuis. lekkere bedden, warme badkamer, heerlijk huis om in thuis te komen na een dag wandelen. Wir haben in Binn eine schöne Woche verbracht. Die Wohnung ist sehr gemütlich und bietet alles, was es für einen angenehmen Aufenthalt braucht. Freundlicher Vermieter, der alle Fragen unsrerseits promt beantwortete. Das Angebot des Dorfladens genügt für den täglichen Bedarf völlig. 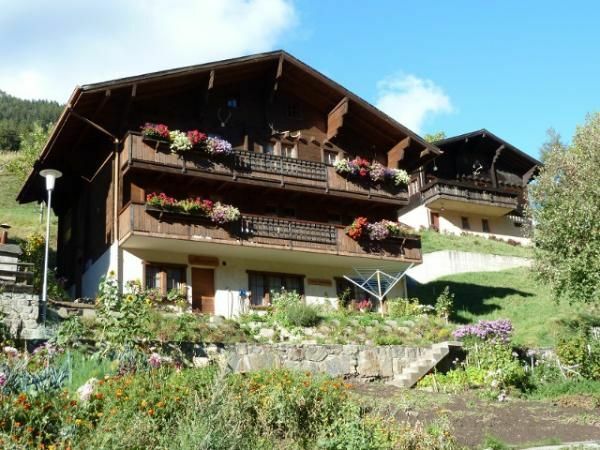 The apartment Alpenrose is located amidst the Valais mountains, in the beautiful mountain village of Binn. For hikers, Miner Lien friends, bikers and those seeking relaxation Binn is the ideal holiday. Whether exciting adventure holiday or just find peace, in Binn is much possible. The natural valley invites you to dream and explore. Frottier- & Bettwäsche sowie Küchentücher sind im Mietpreis inbegriffen. Die Tourismusorganisation schreibt eine Kurtaxe von Fr. 2.- pro Erwachsener/Nacht und Fr. 1.- pro Kind/Nacht vor, diese Gebühren können im ortlichen Tourismusbüro beglichen werden.